Meet Scissero, a new legal AI platform that is marketing itself as ‘the world’s first fully automated lawyer’, and which has just been chosen to be part of Allen & Overy’s Fuse tech innovation space. 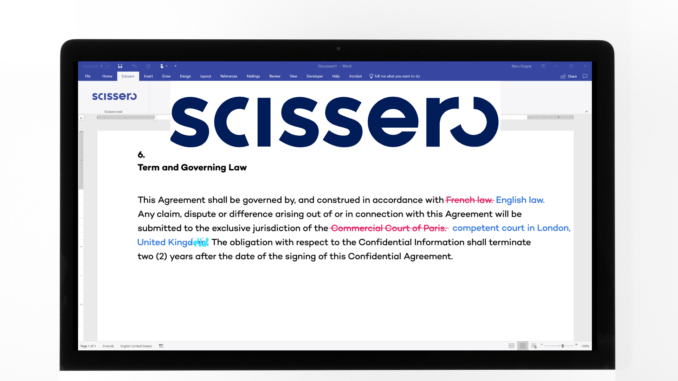 Artificial Lawyer caught up with Scissero founder Mathias Strasser recently to find out some more about his new application, which is focused on helping lawyers with the negotiation and drafting phase of a contract. 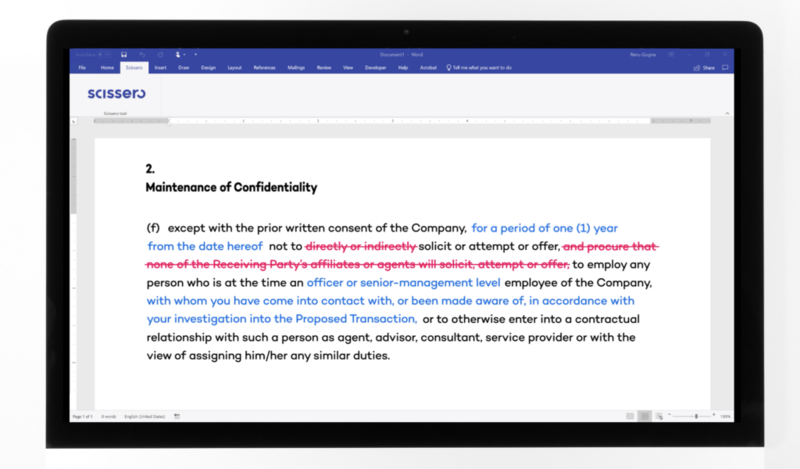 Fundamentally Scissero is an AI tool designed to read a document and then suggest changes, to put it simply. As more and more documents of a certain type, such as an NDA, go through the system it learns from this, helping it to provide a lawyer with better responses according to a firm’s or corporate’s playbook and style. Over time it will become ‘like having a second lawyer at your desk’, automatically helping you to check and improve any contract you are dealing with – or at least that’s the idea. They are using a whole range of approaches to do this, from NLP, to pattern recognition and data clustering, Strasser explains. And when he talks about the tech side you can tell he really is passionate about it. In fact, Strasser is something of dual-qualified expert, having been a lawyer at top US firm Sullivan & Cromwell for about a decade, but is also clearly a very serious coder at the same time. He seems to combine a lawyer’s rigour and focus on detail in legal language, with a passion for leveraging technology to boost efficiency. Overall Scissero feels like a doc automation system on steroids on one level, plus having the ability to respond to text and a playbook with a machine learning and NLP capability. Scissero is also looking at ways it can be of use in other use cases. For example, on its website it states it can be used in more traditional doc review, such as to ‘automatically summarise the contents of data rooms and present them in the form of due diligence reports’. It can also be applied to the re-papering of contracts. The main interface (from company website). Interestingly, Strasser is also a co-owner of Wall Street Docs, a sophisticated document automation system developed primarily with some of the world’s leading banks and which has been around for about nine years. Strasser said that although this could be seen as a legal application, he sees it more as a pure fin tech solution. For him, it’s Scissero that will be the tool that lawyers use. Overall, this all looks like impressive stuff and one gets the feeling that what is on offer here is just the beginning. Probably the biggest risk right now is that Strasser and team, which is based in the US and UK, go in too many directions at the same time. Being part of Fuse may well help everyone to focus on just the things that major commercial law firms such as Allen & Overy want.